The return of the translation hell. 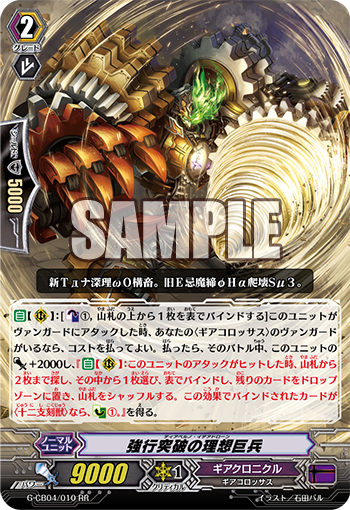 AUTO [R]: [CB1, bind the top card of your deck face up] When this unit attacks a vanguard, if you have a <Gear Colossus> vanguard, you may pay the cost. If you do, until end of battle, this unit gets Power +2000 and “AUTO [R]: When this unit’s attack hits, you may search your deck for up to 2 cards, bind 1 of them face-up, put the remaining cards in the drop zone, and shuffle your deck. If the card bound with this effect is a <Zodiac Time Beast>, CC1.”. Today’s card we’re introducing is “Diaperno Idea-drone”, a 《Gear Chronicle》 Grade 2 Unit that supports Demiurgos from the Clan Booster “Gears of Fate” (on sale September 30th, 2016)! “Diaperno Idea-drone” has an ability that lets you bind the top card of your Deck, and then when your attack Hits, you can look through your Deck to Bind 1 card and send 1 card to the Drop Zone. It’s a card that can be expected to support the purposes of gathering twelve different 〈Zodiac Time Beast〉 to fulfill the Bind conditions of “Deus ex Machina, Demiurgos”. It also becomes an excellent 11000 Attacker, and you shouldn’t overlook the fact that when you Bind a Zodiac Time Beast, you get to Counter Charge 1 card. This means you can nullify the Counter Blast activation cost of its effect! “Idea-drones” are Units that chiefly support “Deus ex Machina, Demiurgos”. You’ll need to focus on how to balance the number of Zodiac Time Beasts and Idea-drones in your Deck. And strengthen your Deck by mixing it with “True Zodiac Time Beast” which goes on sale the same day! !